What is November like in your neck of the woods? Here it means the weather begins to dip towards winter. And by dip, I mean – night time feels like early Winter, and day time feels like …Winter as well. Late Fall is my absolute favorite – mainly because of things like muffins. And spices. And a reason to run the oven without seeming like a crazy person. There is something hiding in these muffins. 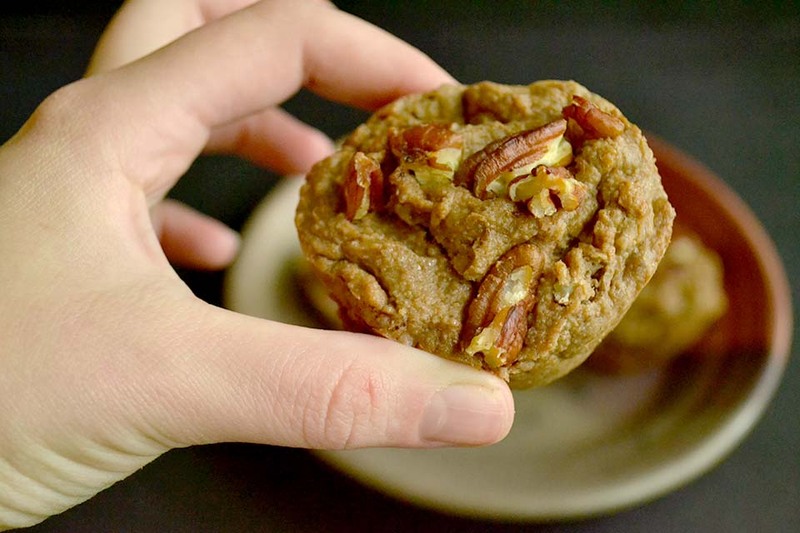 They’re sweet, tasty banana and pecans baked into awesome goodness, but they have a secret. And that secret is called chickpeas. They give the muffins an awesomely moist consistency. I decided to give these muffins a shot after making Dana (from Minimalist Baker’s) Black Bean Brownies. < Which are simply fudgy and amazing. No bean taste. 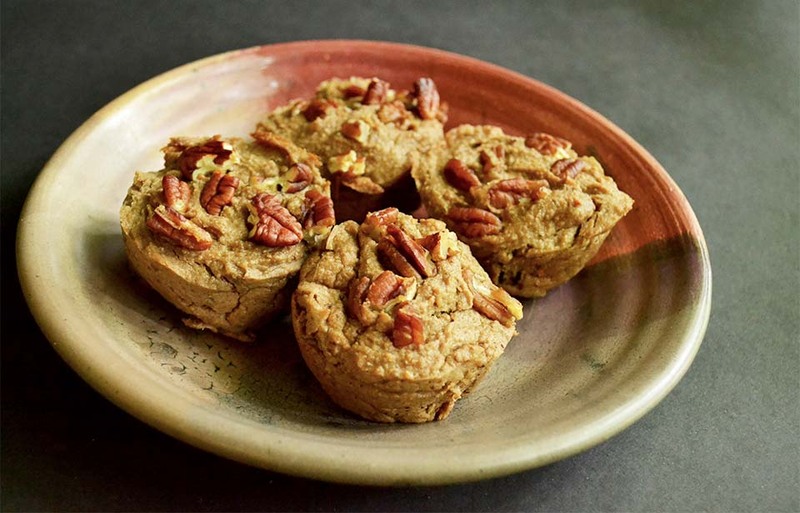 It inspired me to make some breakfast – worthy Banana Pecan Muffins. 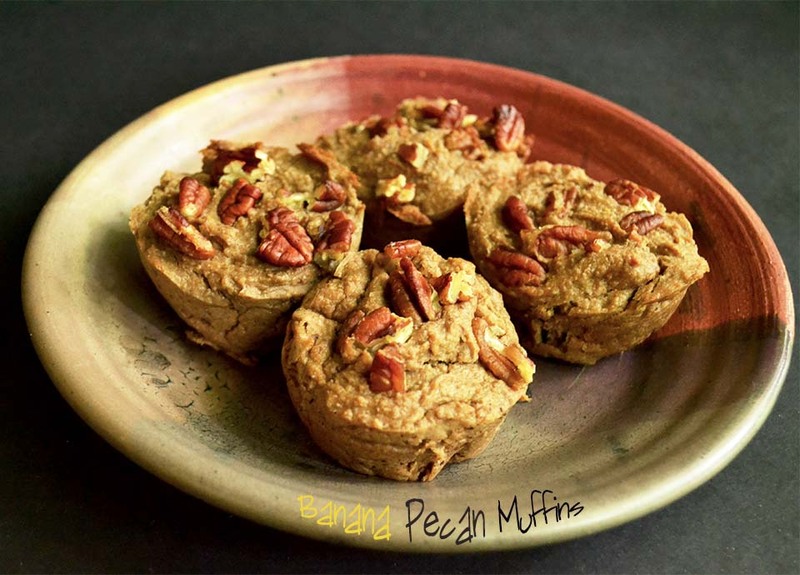 Packed with protein, this will make your breakfast tummy delicious. Preheat the oven to 350 degrees F. Grease 12 muffin tins. Add the flax meal/water or eggs to the food processor with the walnuts and pulse a few times. Then, let sit while rinsing your chickpeas as well as you can possibly imagine washing them. Bake for 45 minutes – 1 hour < This seems like forever but it takes a long time for the middle to get done! …Just watch the pecans on the top and make sure they don’t start burning. You can put tinfoil loosely on top if they do start burning before it’s done on the inside. Then…let cool completely before removing gingerly from muffin tins. Note - if these aren't going to be eaten within a few days I'd refrigerate them for longevity. Thank you!!! They’re so so so good! I can’t wait to hear how you like them!